Freeze the 1, 8, and 9 balls in this order from the left corner pocket along the foot rail. Align the 9 ball with diamond no. 8 as shown. 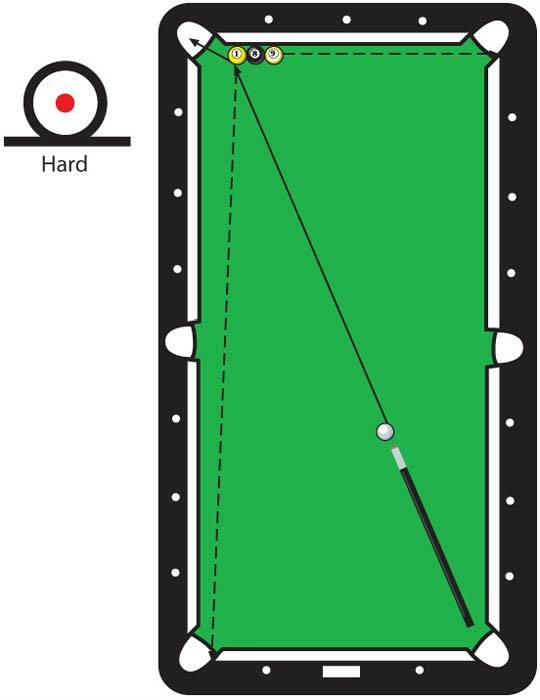 All three balls must be frozen to the rail and to each other so tap them lightly into the table with another ball. Place the cue ball on the right side of the table in line with the right corner pocket. (See diagram). To pocket the two end balls without moving the middle ball, shoot the center of the cue ball right at the edge of the 1 ball with a hard center ball stroke. The 1 ball will bank and the 9 goes straight in. Shoot the cue ball to scratch in the pocket. When as many as three balls are frozen to a rail and each other, the third ball is always dead to its pocket, no matter how you force the first ball into the second.